Above: The racecar drivers Enzo Ferrari (1st from left), Tazio Nuvolari (4th) and Achille Varzi (6th) of Alfa Romeo with Alfa Romeo Managing Director Prospero Gianferrari (3rd) at Colle Maddalena. The Ferrari automobile company has produced sports cars since 1947. 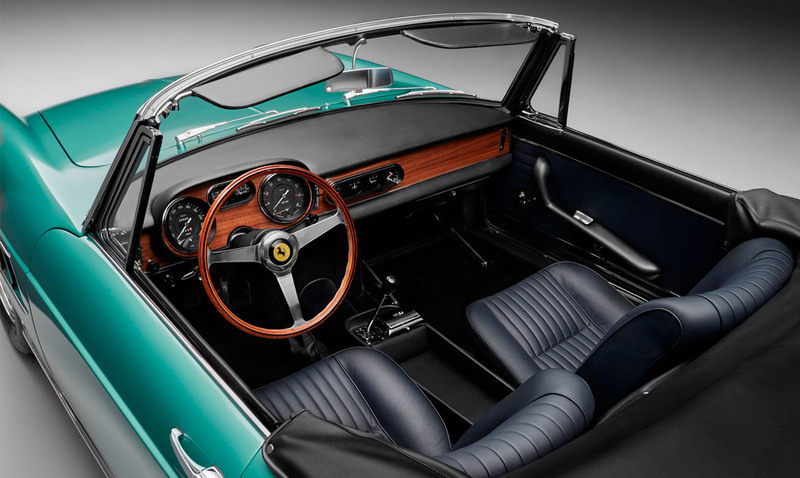 Unlike many similar yet independent companies, FIAT-owned Ferrari continued to thrive after the death of its charismatic founder and is today one of the most successful sports car companies in the world. The first Ferrari road car was the 1947 125 Sport, powered by a 1.5 L V12 engine; Enzo reluctantly built and sold his automobiles to fund the Scuderia. While his beautiful and blazingly fast cars quickly gained a reputation for excellence, Enzo maintained a famous distaste for his customers, most of whom he felt were buying his cars for the prestige and not the performance. Enzo Ferrari's strong personality had served his company and racing team well for decades. But internal tensions reached the boiling point in November 1961 Long-time sales manager, Girolamo Gardini, had long chafed at Enzo's wife, Laura's involvement in the company. The two frequently argued, but their dispute became a crisis for the company when Gardini made an ultimatum to Enzo: If tensions continued, he would leave the company. Enzo was never a man to accept a challenge to his authority, and he dealt with the situation with a typically heavy hand. Gardini was ousted, as was Scuderia Ferrari manager, Romolo Tavoni, chief engineer Carlo Chiti, experimental sports car development chief, Giotto Bizzarrini, and a number of others who stood by them. All were tremendous losses to the company, and many thought this might be the end of Ferrari. Indeed, the defectors immediately formed a new company, ATS, to directly compete with Ferrari on the street and the track, and took with them Scuderia Serenissima, one of Ferrari's best racing customers. This "great walkout" came at an especially difficult time for Ferrari. At the urging of Chiti, the company was developing a new 250-based model to defend its honor against the Jaguar E-Type. Development of this car, the 250 GTO, was at a critical point, with the chassis development and styling left incomplete. Even if the car could be finished, it was unclear if it could be raced successfully without Tavoni and his lieutenants. Into this void stepped young engineer Mauro Forghieri and long-time racing bodyman, Sergio Scaglietti. Both were up to the task, with Forghieri successfully honing the GTO's handling and Scaglietti designing an all-new body for the car. The GTO went to Sebring with driver Phil Hill and placed first in class. It continued winning through 1962, brushing aside the challenge from Jaguar and becoming one of the most famous sports cars in history. This shakeup, and Forghieri's engineering talent, made the 1960s even more successful for Ferrari than the previous decade. The mid-engined Dino racers laid the foundation for Forghieri's dominant 250-powered 250 P. On the street, the Dino road cars sold strongly, and legendary models like the 275 and Daytona were on the way. The big V8-powered Shelby Cobra developed and built by the American engineer Carroll Shelby challenged the Ferraris in the early 1960s. By mid 60's, Ford tried to buy Ferrari but no agreement was reached. Instead, after being defeated in 1964 and 1965 races the Ford GT40 ended the dominance of Ferrari Prototypes at the 24 Hours of Le Mans in 1966 when the GT-40 Mark II dominated the race with a 1-2-3 finish.. Ford would win again in 1967, this time with its Mark IV prototype and also in 1968 and 1969 with the same GT-40 Mark II car winning both years to close out the decade against the new and upcoming Porsche 917. After the performance of the big V8-powered Ford at the 1967 Le Mans, the FIA banned prototypes over 3000cc, which also affected the Ferrari 330P models. This was announced in late 1967 and came in effect for 1968, and the Scuderia did not take part in Sports car racing in order to protest this. These years saw a new challenger. Formerly competing with smaller cars only, the Germans entered the new 3 litre sports car prototype class in 1968 with the Porsche 908, while Ferrari raced the Ferrari 312P in only few events in 1969. In March of that year, the presentation of the 5 litre Porsche 917, built in advance in 25 exemplars, had surprised also Ferrari, which answered later that year with the production of 25 Ferrari 512S, funded from the money gained by the FIAT deal. At that time, Porsche had almost a full season of experience with their new car, though, and also taken the World Sportscar Championship where Ferrari was only 4th. The year 1970 saw epic battles between the two teams and the many cars they entered, yet Porsche won all races except the 12 Hours of Sebring, where the victorious car and its drivers Ignazio Giunti/Nino Vaccarella/Mario Andretti had their origins in Italy. Ferrari decided to give up the 512 in 1971 in order to prepare the new Ferrari 312PB for the 1972 season, when only 3 litre class would be allowed. In addition to Porsche, the old national rival with its Alfa Romeo T33/3 also had won two races in 1971, and thus was ranked 2nd in the World Championship, above Ferrari. The Ferrari 312PB models dominated the World Sportscar Championship in 1972 against rival Alfa Romeo, as the Porsche factory did not compete after the rule changes, and Matra focused on Le Mans only. In their home race, the French won, as Ferrari did not enter in 1972 due insufficient reliability over 24 hours, in order not to blemish their otherwise perfect record in that season. In 1973, though, the Matra team also challenged for the championship which Ferrari eventually lost with two wins, compared to Matra's five, while Alfa Romeo had not entered that year. In addition, Ferrari was now forced to race also at Le Mans, despite concerns that even the modified engine would not last. Yet, one car survived and scored an unexpected and honourable 2nd place. Ferrari then retired from Sports car racing to focus on the ailing F1 effort. When Enzo died in 1988, Ferrari finally became a mythos. The value of used cars rose, as well as sales of current models. The last new model he commissioned was the specialist F40. The hiring of Michael Schumacher and other members from Benetton triggered a comeback of the F1 team, with three wins in 1996, and close yet eventually losing challenges to the driver's championship in the years 1997 to 1999. In an unprecedented and record-setting fashion, Schumacher and Ferrari dominate F1 winning the World Driver's championship from 2000 through 2004 and the Constructors' Championship from 1999 through 2004. 2006 saw him retire from F1. As of 2004, FIAT owns 56% of Ferrari, Mediobanca owns 15%, Commerzbank owns 10%, Lehman Brothers owns 7%, and Enzo's adopted son Piero Ferrari owns 10%. Of these, Ferrari is under main control of the Fiat Group, containing Alfa Romeo as well.